Police are stepping up efforts against the recent phenomenon of “scary clowns” harassing citizens in recent days at various locations around the country. Earlier yesterday, two youths dressed as clowns who frightened passersby were arrested in Kiryat Gat in southern Israel. They claimed that they were simply playing a practical joke, but police decided to take them into the police youth department for investigation. 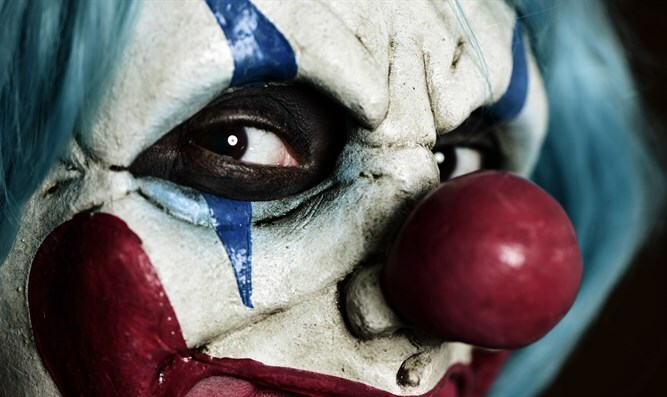 These cases come following the opening of an investigation launched last week in Dimona against four 12 -year-olds dressed as clowns who were apprehended after they harassed local residents. In this case, due to their young age, the suspects were transferred to welfare authorities. A similar incident occurred in Afula, where the case was also handed to welfare authorities. Police noted that a common denominator in these cases was the desire to engage in a prank and take part in the unacceptable trend. Also conspicuous was the lack of awareness that acts of this nature were considered criminal and would be met with a determined response from law enforcement authorities. It was also found that, in many cases, the parents of youth were not even aware of their children’s activities. "Israel Police will continue to prevent public intimidation and harassment which violate public order and disrupt daily routine, and such acts will encounter uncompromising enforcement," police said.